Our basic test batch from last soap week. 6 ounces Hydrogenated Soy, 5 ounces Coconut Oil, 4 ounces Olive Oil, 1 ounce Mango Butter. The scent is Blackberry Sage. This scent is noted to make great room sprays, lotions, liquid soaps, shampoos and more, it just doesn’t work in cold process soap. 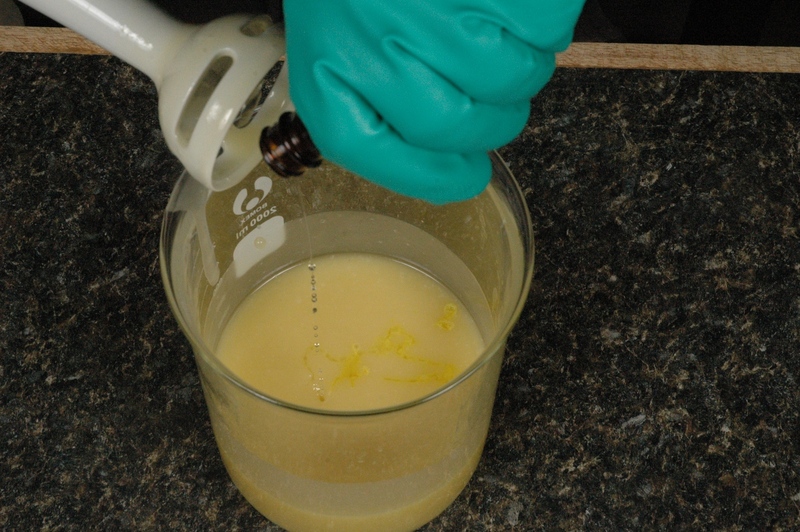 We will add about 1/3 fluid ounce fragrance to our test batch. Prepare your tea kettle before you collect your soap supplies. Set it on the stove to heat. Collect your soap supplies. Once the water comes to a boil, pour the water in a cup over a tea bag, and set aside. Put the kettle back on the stove, you need to maintain at least a simmer. Weigh the fats. Weigh the sodium hydroxide. Measure the cold water and add your weighed amount of lye. Stir well. When you add the lye solution to the fat mixture start blending with an immersion blender. Take the soap almost to a trace. If you can’t remember the definition of trace, go back to the previous blog posts and catch up to today. Add the fragrance oil, first in a few drops. See the white change in our soap where the fragrance oil was dropped? This fragrance will accelerate trace. We are going to go from liquid, to mashed potatoes, to concrete in less than 30 seconds. Quick! Get the tea pot! A dose of boiling water over the top, about ½ cup, then stir it in, and blend if possible. Pour into your mold. The boiling water does the trick to thin the soap so it is fluid again, or at least fluid enough to pour. Your brow probably has beads of sweat. Now, you can be relieved that you use a mold that has some extra height (the additional water takes up space) and you have mastered saving a batch. Once you have cleared the counter of your work you tea is the perfect drinking temperature. In all the years we have made soap, there was only one batch that couldn’t be saved by this method. We discarded it in the trash. 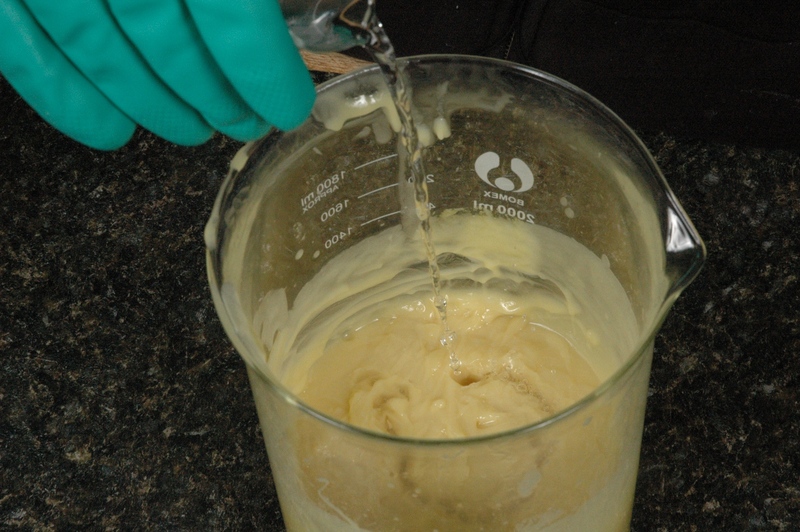 You might wonder why we don’t save each of our test batches when we make soap. The reason is we want to see the results of the soap through normal processing. Certainly we could wait to rebatch later, but it just isn’t worth our time for these test batches. 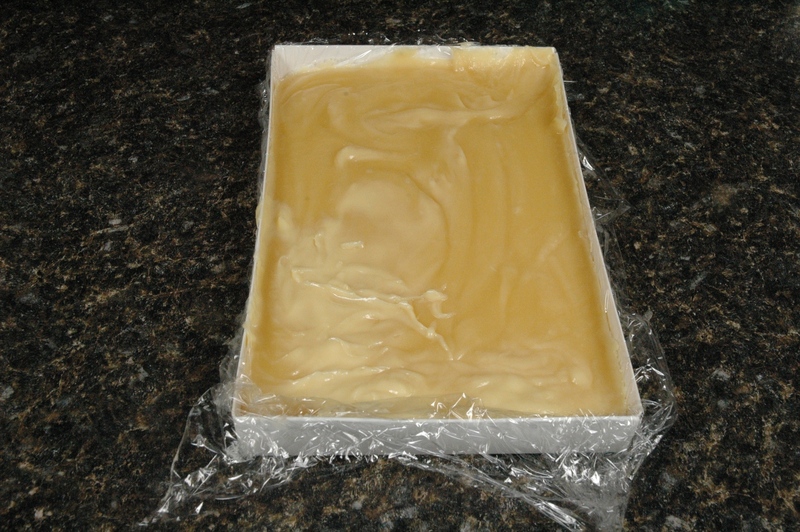 Rebatching is only a way to save a batch of soap you would otherwise discard. It will compromise the soap shelf life, makes the soap cosmetically challenged and isn’t the cleanest task to ever undertake domestically. Even if you don’t think you will need the tea kettle, put one on anyway. The worst thing that can happen is you have the water left in the kettle when you are done. The hot water in your kettle is the perfect excuse for making tea, cocoa or another hot beverage. Next week is all about the face and nails. We are going to make a mask, a lotion, an exfoliating soap, cuticle jelly and a cuticle oil. I’m so excited for this! Lots of this next week will end up in the Mother’s Day Gift Baskets! Don’t forget about the drawing! Blending oils and lye solution. 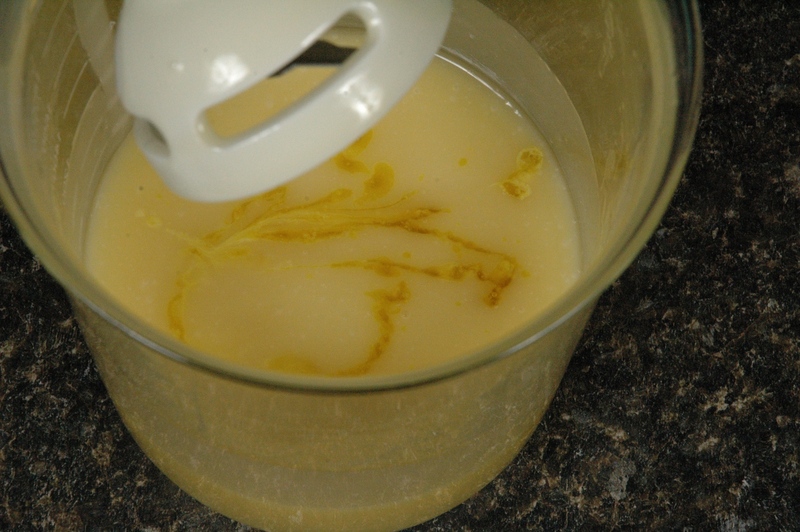 Fragrance oil reacting with raw soap. Adding hot water to our failed soap. 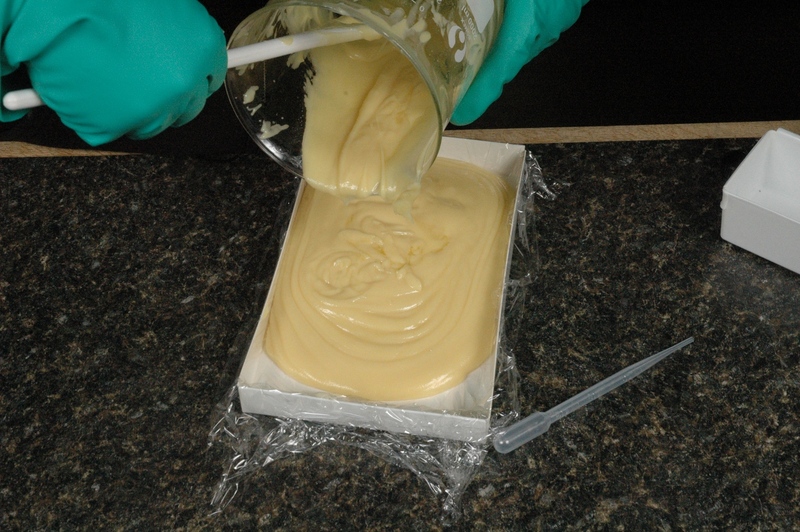 Pouring fixed soap into the mold. The soap starting the gel phase. The soap is so much smoother now. 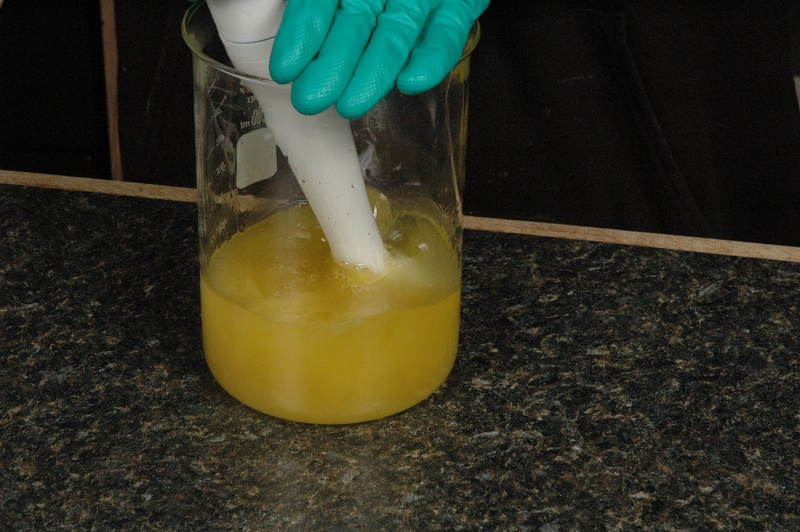 Scraping soap out of the beaker. A nice temperature of 160 degree Farenheit. OOH! This is great information to have — just in case I have a fragrance that has given me trouble in the past! Or, like you say, to just enjoy a cup of tea afterwards! So, about 1/2 c. simmering water to each pound of oils in the recipe. Awesome! Thanks! My OCD monster is still a little timid about using soap 24hr. after it’s cut. If I mix my lye and fats at a higher temp. and only blend to a fluid trace then my process will be like your lessons. 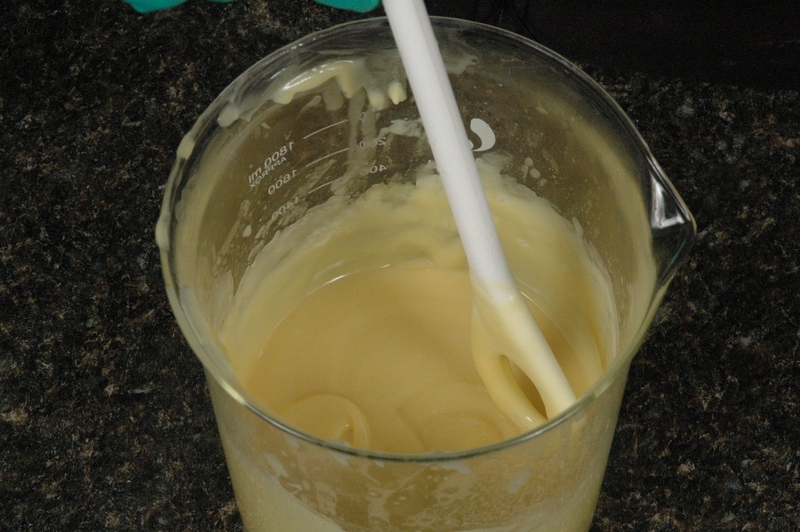 I have made soap with and without the gel phase and if this is an important step in a properly made soap, I will gel. 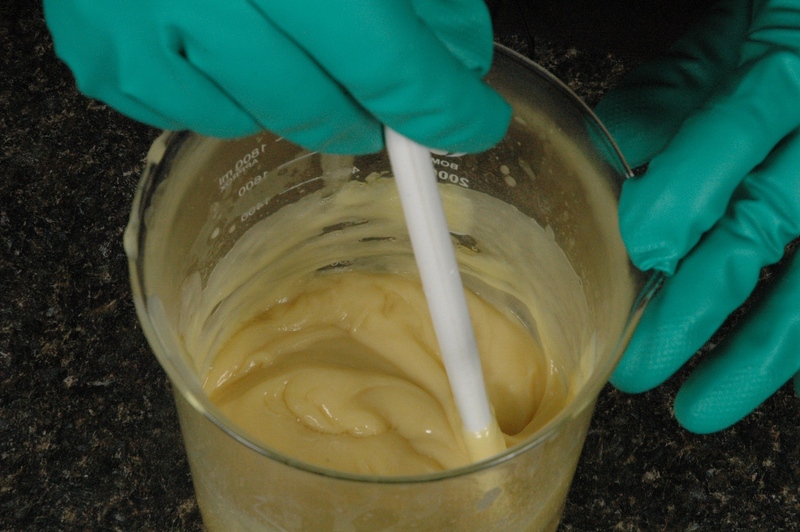 So I guess what I am really (humbly) asking is…what is a properly made soap and what is a failed (unsafe for skin) batch. 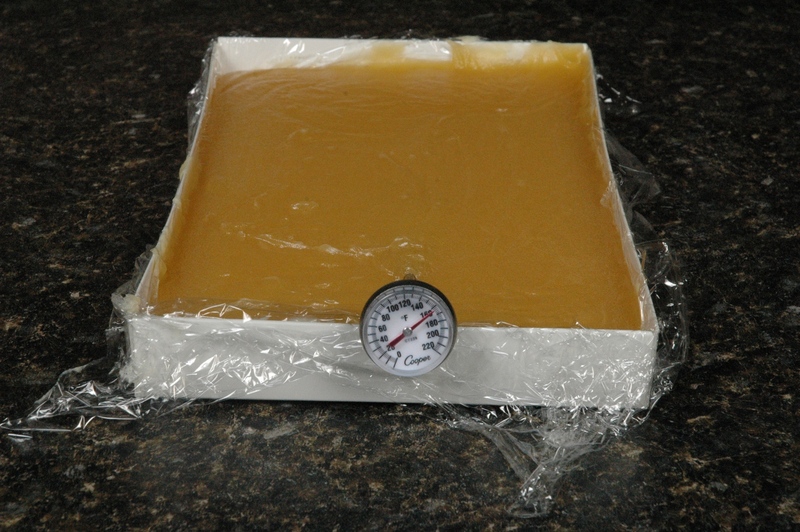 Could you give us a brief summary or a basic guide line for the Cold Process Soap? Is a zap or ph test something we need to do? I asked Tina for help answering your question. Here is her response. Gel phase is the time your soap becomes its own creature. The soap appears to be living and breathing during this phase. Let’s think of phases like we view humans. People go through phases, some get stuck in phases and never seem to be able to get out. Soap isn’t one of those people. Soap going through gel phase is like a teenager, the hormones are raging and overtaking all sense of refinement and composure. 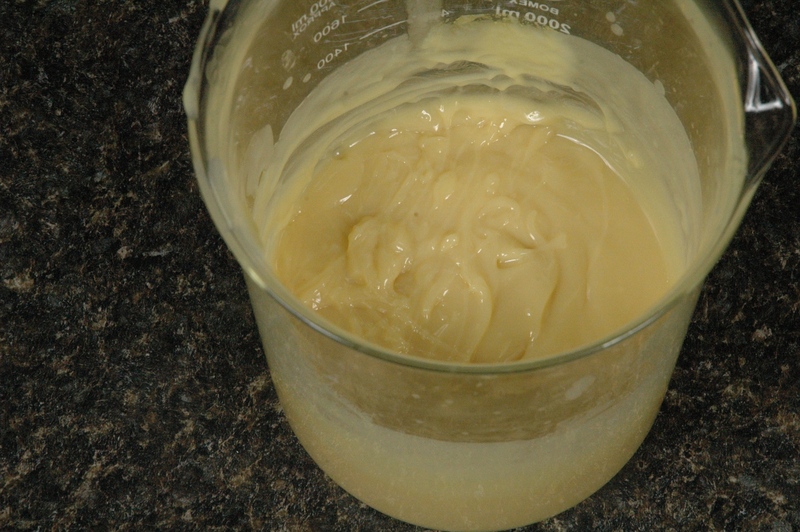 When the hormones calm down the resulting human is actually pretty decent, the same is true for your soap, when gel phase is complete, the soap is pretty decent. If you aren’t tempted to use the soap in 24 hours, then wait for 48. Once you see a real crust on the outside of the soap. Don’t confuse soda ash with an air dried crust. There is a big difference. The air dried crust I am talking about means it isn’t shiny anymore and the soap feels dry. If you want, put the soap near a fan. The air moving will help dry out the soap. Your first bars of soap that are only 24 to 48 hours old may only last 3 to 7 days in a shower. They are quite wet and dissolve rather quickly. They certainly aren’t ready for sale yet. Give them enough air circulation and they will be ready in a few weeks, but no need to wait 8 weeks unless it rains cats and dogs for 6 weeks straight. If it rains that much, I doubt your soap will be on the high priority list. Once you try a fresh soap, giving yourself credit for a job well done, then you will love your skills even more. Oh my!! So for a 4 # batch that’s seizing on me, I would add 2 cups of boiling water to it? Holy cow! Now this tells me it’s going to take longer than 4-6 weeks to cure….? Correct? And I always use the full amount of water from your calculator. How long do you think it should stay in the mold before trying to unmold and cut? WOW – I’m sorry, I just can’t get over this!! put more FO in after it’s done, but at least I saved all those ingredients – LOL! *Up to* two cups of boiling water. Most times I don’t need a full 1/2. It seems the larger the batch the less water you need per lb of fats. Start with a 1/2 cup for this size batch and add a bit more as needed. It will probably take the same amount of time to cure. If you don’t put in the full 2 cups of water, you won’t have a great deal of shrinkage. Don’t treat the batch any other way, just act like it is normal. Thanks you two for being so patient with me and for the gel explanation. Your easy, logical and fun CP soap method fits into my brain and I feel more confident about producing a higher quality soap. unsafe. So before I make any more soap I was wondering what to do with the soap I already have. I am very excited to up-grade my skills and soap. The only thing funnier than my OCD monster is my OCD monster with the deer in the headlights syndrome. Failed soap doesn’t mean unsafe soap. Failed batches are soaps which turn out different than we want them. When we listed the 30+ test batches MMS had, and we gave photos of all of them, several of the soaps marked failed were sent as free samples. They are safe to use, just not desirable in appearance, texture or final scent. Let’s take the failed batch from our mixing the other day. What you can’t see in that photo is a rice-like appearance in the soap. This means that oil remains floating in the pot and, if left, it will float to the surface and never become part of the bar. That floating oil/riced appearance makes an unsafe bar. It will be far too drying to use on the skin. This is why we fix it with boiling water. If trace is just very thick the soap is fine, UNLESS you see what we will show in our next blog. didn’t you used to sell ‘mold release’? I’m not happy with all of the wrinkles left from Saran Wrap…. tho I love how it releases. Thanks. 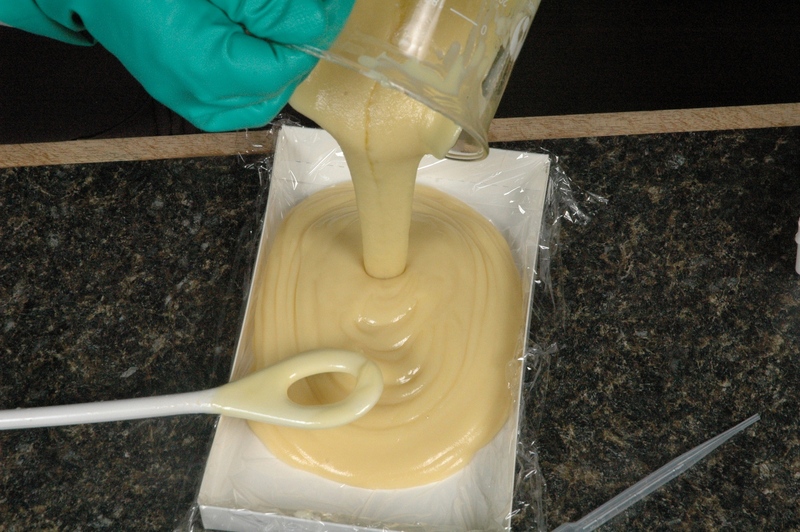 We recommend using Vaseline, mineral oil or silicone spray for a mold release. Do not use Pam or any other non-stick cooking spray.